The British Campaign in France. III. The Battle of the Marne is the 4th article, published in july 1916, in a series of 21 articles written by Arthur Conan Doyle serialized in The Strand Magazine. 3.1.2 " Die Grosse Zeit." 3.1.3 The Turn of the Tide. 3.1.4 The Battle of the Ourcq. 3.1.7 The 1st Lincolns and the Guns. 3.1.8 Sixth Brigade's Action at Hautvesnes. 3.1.9 Ninth Brigade's Capture of Germans at Vinly. 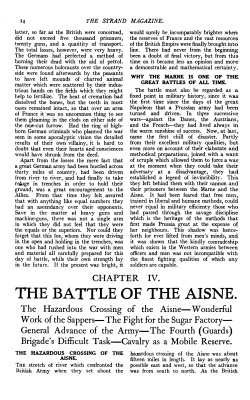 3.1.10 The Problem of the Aisne. 3.1.11 Why the Marne is one off the Great Battles of All Time. 3.2 Chapter IV. The Battle of the Aisne. 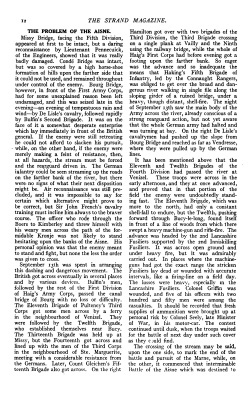 3.2.1 The Hazardous Crossing of the Aisne. 3.2.2 Wonderful Work of the Sappers. 3.2.3 The Fight for the Sugar Factory. 3.2.4 General Advance of the Army. 3.2.5 The Fourth (Guards) Brigade's Difficult Task. 3.2.6 Cavalry as a Mobile Reserve. 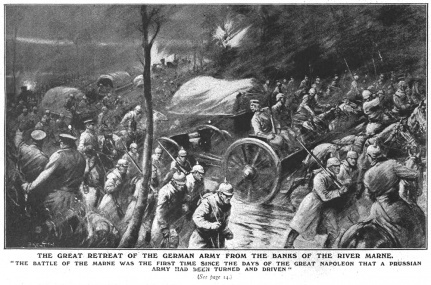 The great retreat of the German army from the banks of the river Marne. 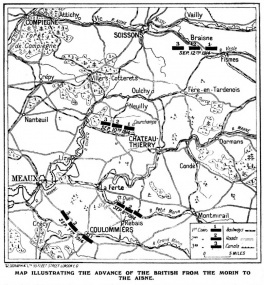 Map illustrating the advance of the British from the Morin to Aisne. British infantry disloging the Germans during the forcing of the river Morin - A typical incident during the German retreat from Paris. "Coming behind the battery the 1st Lincolns poured in a rapid fire at two hundred and fifty yards, which laid every man of the German gunners upon the ground. The whole battery was captured." British troops, under shell-fire, crossing the Aisne in single file by means of the girder of a ruined bridge. 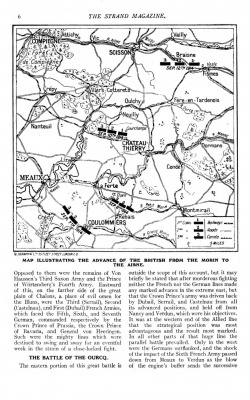 Map showing the British advance at the battle of the Aisne. 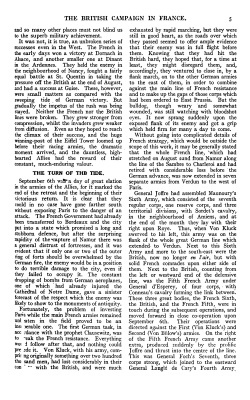 The General Situation — "Die Grosse Zeit" — The Turn of the Tide — The Battle of the Ourcq — The British Advance — Cavalry Fighting — Forcing the Rivers — The 1st Lincolns and the Guns — Sixth Brigade's Action at Hautvesne — Ninth Brigade's Capture of Germans at Vinly — The Problem of the Aisne — Why the Marne is One of the Great Battles of All Time. There are several problems connected with the strategical opening of the great war which will furnish food for debate among military critics for many years to come. One of these already alluded to, is the French offensive taken in Alsace and Lorraine. It ended in check in both cases, and yet its ultimate effects in confusing the German plans are deflecting German armies which might has been better used elsewhere may be held to justify the French in their strategy. Another remarkable and questionable move now obtrudes itself, this time upon the part of the Germans. Very shortly after the out break of war, the Russians had pushed their covering armies over the frontier of East Prussia, and had defeated a German force at Gumbinnen, with a loss of prisoners and guns. A few days later the left wing of the wide-spread, and as yet only partially mobilized, Russian army struck heavily at the Austrians in the south near Lemberg, where after a week of fighting they gained a great victory, with prisoners, which amounted to over seventy thousand men and a large booty of guns and supplies. Before this blow bad befallen their cause, and influenced only by the fact that the Russian right wing, was encroaching upon the sacred soil of the Fatherland, a considerable force was detached from the invading armies in France and dispatched to the Eastern front. These men were largely drawn from the Third (Saxon) Army of Von Haussen. Such a withdrawal at such a time could only mean that the German general staff considered that the situation in France was assured, and that they had still sufficient means to carry on a victorious invasion. Events were to show that they were utterly mistaken in their calculation. It is true that, aided by these reinforcements, Von Hindenburg succeeded on August 31st in inflicting a severe defeat upon the Russians at the battle of Tannenberg, but subsequent events proved that such a victory could have no decisive result, while the weakening of the armies in France may have had a permanent effect upon the whole course of the war. At the very moment that the Germans were withdrawing troops from their Western front the British and French were doing all they could to thicken their own line of resistance, especially by the transference of armies from Alsace and the south. 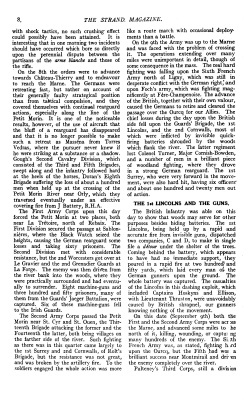 Thus the net result was that, whereas the Germans had up to August 25th a very marked superiority in numbers, by the beginning of September the forces were more equal. From that moment the chance of their taking Paris became steadily more and more remote. The first month of the war represented a very remarkable military achievement upon the part of Germany. In her high state of preparation as compared with the Allies, it was to be expected that the beginning of hostilities would be all in her favour, but the reality exceeded what could have been foreseen. Her great armies were ready to the last button. Up to the eve of war the soldiers did not themselves know what their field uniform was like. At the last moment two millions of men filed into the depots and emerged in half an hour clad in grey, with new boots, equipment, and every possible need for the campaign. On her artillery surprises she set special store, and they were upon a vast scale. The machine-gun had been developed to an extent unknown by other armies, and of these deadly little weapons it is said that no fewer than fifty thousand were available. From the tiny quick-firer, carried easily by two men upon a stretcher, to the vast cannon with a diameter of sixteen and a half inches at the mouth, taking three railway trucks for its majestic portage, every possible variety of man-killing engine was ready in vast profusion. So, too, was the flying service, from the little Taube to the huge six-hundred-foot Zeppelin. From these latter devices great results were expected which were not destined to materialize, for, apart from reconnaissances, they proved themselves to be machines rather for the murder of non-combatants than for honest warfare. Making every allowance for the huge advantage which the nation that knows war is Coming must always enjoy over those which merely fear that it may come, it would be foolish to deny the vast military achievement Of Germany in the month of August. It reflects great credit upon the bravery and energy of her troops, as well as upon the foresight of her organizers and the capacity of her leaders. Though we are her enemies, our admiration would have been whole-hearted were it not for the brutalities which marked her advance both in Poland, in Belgium, and in France. Consider that wonderful panorama of victory which was known all over the Fatherland as "Die grosse Zeit." On August 10th fell the great fortress of Liege, on the 24th the great fortress of Namur, early in September that of Maubeuge, while the smaller strongholds went down as if they were open cities. 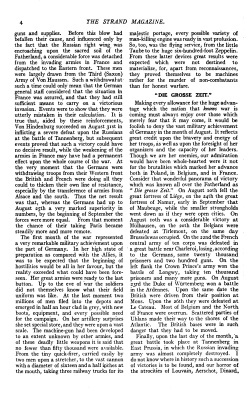 On August 10th was a considerable victory at Mülhausen, on the 20th the Belgians were defeated at Tirlemont, on the same day Brussels was occupied. On the 22nd the French central army of ten corps was defeated in a great battle near Charleroi, losing, according to the Germans, some twenty thousand prisoners and two hundred guns. On the left flank the Crown Prince's army won the battle of Longwy, taking ten thousand prisoners and many more guns. On August 23rd the Duke of Würtemberg won a battle in the Ardennes. Upon the same date the British were driven from their position at Mons. Upon the 26th they were defeated at Le Gateau. Most of Belgium and the North of France were overrun. Scattered parties of Uhlans made their way to the shores of the Atlantic. The British bases were in such danger that they had to be moved. Finally, upon the last day of the month, "a great battle took place at Tannenberg in East Prussia, in which the Russian invading army was almost completely destroyed. I do not know where in history such a succession of victories is to be found, and our horror of the atrocities of Louvain, Aerschot, Dinard, and so many other places must not blind us to the superb military achievement. It was not, it is true, an unbroken series of successes even in the West. The French in the early days won a victory at Dornach in Alsace, and another smaller one at Dinant in the Ardennes. They held the enemy in the neighbourhood of Nancy, fought a fairly equal battle at St. Quentin in taking the pressure off the British at the end of August, and had a success at Guise. These, however, were small matters as compared with the sweeping tide of German victory. But gradually the impetus of the rush was being stayed. Neither the French nor the British lines were broken. They grew stronger from compression, whilst the invaders grew weaker from diffusion. Even as they hoped to reach the climax of their success, and the huge winning-post of the Eiffel Tower loomed up before their racing armies, the dramatic moment arrived, and the dauntless, high-hearted Allies had the reward of their constant, much-enduring valour. September 6th was a day of great elation in the armies of the Allies, for it marked the end of the retreat and the beginning of their victorious return. It is clear that they could in no case have gone farther south without exposing Paris to the danger of an attack. The French Government had already been transferred to Bordeaux and the city put into a state which promised a long and stubborn defence, but after the surprising rapidity of the capture of Namur there was a general distrust of fortresses, and it was evident that if only one or two of the outer ring of forts should be overwhelmed by the German fire, the enemy would be in a position to do terrible damage to the city, even if they failed to occupy it. The constant dropping of bombs from German aeroplanes, one of which had already injured the Cathedral of Notre Dame, gave a sinister forecast of the respect which the enemy was likely to show to the monuments of antiquity. Fortunately, the problem of investing Paris while the main French armies remained unbeaten in the field proved to be an insuperable one. The first German task, in accordance with the prophet Clausewitz, was to break the French resistance. Everything would follow after that, and nothing could precede it. Von Kluck, with his army, comprising originally something over two hundred thousand men, had lost considerably in their con... with the British, and were much exhausted by rapid marching, but they were still in good heart, as the roads over which they passed seemed to offer ample evidence that their enemy was in full flight before them. Knowing that they had hit the British hard, they hoped that, for a time at least, they might disregard them, and, accordingly, they ventured. to close in, by a flank march, on to the other German armies to the east of them, in order to combine against the main line of French resistance and to make up the gaps of those corps which had been ordered to East Prussia. But the bulldog, though weary and somewhat wounded, was still watching with bloodshot eyes. It now sprang suddenly upon the exposed flank of its enemy and got a grip which held firm for many a day to come. Without going into complicated details of French strategy, which would be outside the scope of this work, it may be generally stated that the whole French line, which had stretched on August 22nd from Namur along the line of the Sambre to Charleroi and had retired with considerable loss before the German advance, was now extended in seven separate armies from Verdun to the west of Paris. General Joffre had assembled Maunoury's Sixth Army, which consisted of the seventh regular corps, one reserve corps, and three territorial divisions, with Sordet's cavalry, in the neighbourhood of Amiens, and at the end of the month they lay with their right upon Roye. Thus, when Von Kluck swerved to his left, this army was on the flank of the whole great German line which extended to Verdun. Next to this Sixth Army and more to the south-east were the British, now no longer en l'air, but with solid French comrades upon either side of them. Next to the British, counting from the left or westward end of the defensive line, was the Fifth French Army under General d'Esperey, of four corps, with Conneau's cavalry forming the link between. These three great bodies, the French Sixth, the British, and the French Fifth, were in touch during the subsequent operations, and moved forward in close co-operation upon September 6th. Their operations were directed against the First (Von Kluck's) and Second (Von Bülow's) armies. On the right of the Fifth French Army came another extra, produced Suddenly by the prolific Joffre and thrust into the centre of the line. This was General Foch's Seventh, three corps strong, which joined to the eastward General Langlé de Cary's Fourth Army. Opposed to them were the remains of Von Haussen's Third Saxon Army and the Prince of Würtemberg's Fourth Army. Eastward of this, on the farther side of the great plain of Chalons, a place o f evil omen for the Huns, were the Third (Serrail), Second (Castelnau), and First (Dubail) French Armies, which faced the Fifth, Sixth, and Seventh German, commanded respectively by the Crown Prince of Prussia, the Crown Prince of Bavaria, and General von Heeringen. Such were the mighty lines which were destined to swing and sway fur an eventful week in the strain of a close-locked fight. The Battle of the Ourcq. The eastern portion of this great battle is outside the scope of this account, but it may briefly be stated that after murderous fighting neither the French nor the German lines made any marked advance in the extreme east, but that the Crown Prince's army was driven back by Dubail, Serrail, and Castelnau from all its advanced positions, and held off from Nancy and Verdun, which were his objectives. It was at the western end o f the Allied line that the strategical position was most advantageous and the result most marked. In all other parts of that huge line the parallel battle prevailed. Only in the west were the Germans outflanked, and the shock of the impact of the Sixth French Army passed down from Meaux to Verdun as the blow of the engine's buffer sends the successive crashes along a line of trucks. This French army was, as already stated, upon the extreme outside right of Von Kluck's army, divided from it only by the River Ourcq. This was the deciding factor in the subsequent operations. By midday upon September 6th, according to the despatch of Sir John French, the Germans had realized their dangerous position. The British Army, consisting of five divisions and five cavalry brigades, with its depleted ranks filled up with reinforcements and some of its lost guns replaced, was advancing from the south through the forest of Crécy, men who had limped south with bleeding feet at two miles an hour changing their gait to four or five now that they were bound northward. Von Kluck had placed nothing more substantial than a cavalry screen of two divisions in front of them, while he had detached a strong force of infantry and artillery to fight a rearguard action against the Sixth French Army and prevent it from crossing the Ourcq. The desperate struggle of September 6th, 7th, 8th, and 9th between Von Kluck and Maunoury may be looked upon as the turning-point of the war. Von Kluck had originally 'faced Maunoury with his Fourth Reserve Corps, on the defensive. Recognizing how critical it was that Maunoury should be crushed, he passed back two more army corps —the Seventh and Second — across the Ourcq, and fell upon the French with such violence that for two days it was impossible to say which side would win. Maunoury and his men fought magnificently, and the Germans showed equal valour. At one time the situation seemed desperate, but twenty thousand men, odds and ends of every kind — Republican Guards, gendarmes, and others — were rushed out from Paris in a five-mile line of automobiles, and the action was restored. Only on the morning of the 10th did the Germans withdraw in despair, held in their front by the brave Maunoury, and in danger of being cut off by the British to the east of them. 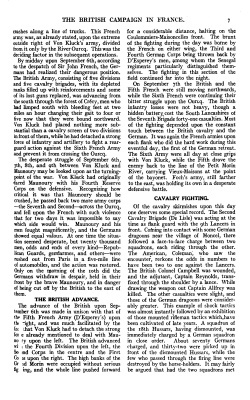 The advance of the British upon September 6th was made in unison with that of the Fifth French Army (D'Esperey's) upon the night, and was much facilitated by the fact that Von Kluck had to detach the strong force already mentioned to deal with Maunoury upon the left. The British advanced with the Fourth Division upon the left, the Second Corps in the centre and the First Corps upon the right. The high banks of the Grand Morin were occupied without serious figuring, and the whole line pushed forward for a considerable distance, halting on the Coulommiers-Maisoncelles front. The brunt of the fighting during the day was borne by the French on either wing, the Third and Fourth German Corps being thrown back by D'Esperey's men, among whom the Senegal regiments particularly distinguished themselves. The fighting in this section of the field continued far into the night. On September 7th the British and the Fifth French were still moving northwards, while the Sixth French were continuing their bitter struggle upon the Ourcq. The British infantry losses were not heavy, though a hidden battery_cost the South Lancashires of the Seventh Brigade forty-one casualties. Most of the fighting depended upon the constant touch between the British cavalry and the German. It was again the French armies upon each flank who did the hard work during this eventful day, the first of the German retreat. The Sixth Army were all day at close grips with Von Kluck, while the Fifth drove the enemy back to the line of the Petit Morin River, carrying Vieux-Maisons at the point of the bayonet. Foch's army, still farther to the east, was holding its own in a desperate defensive battle. Of the cavalry skirmishes upon this day one deserves some special record. The Second Cavalry Brigade (De Lisle) was acting at the time as flank guard with the 9th Lancers in front. Coming into contact with some German dragoons near the village of Moncel, there followed a face-to-face charge between two squadrons, each riding through the other. The American, Coleman, who saw the encounter, reckons the odds in numbers to have been two to one against the Lancers. The British Colonel Campbell was wounded, and the adjutant, Captain Reynolds, transfixed through the shoulder by a lance. While drawing the weapon out Captain Allfrey was killed. The other casualties were slight, and those of the German dragoons were considerably greater. This example of shock tactics was almost instantly followed by an exhibition of those mounted rifleman tactics which have been cultivated of late years. A squadron of the 28th Hussars, having dismounted, was immediately charged by a German squadron in close order. About seventy Germans charged, and thirty-two were picked up in front of the dismounted Hussars, while the few who passed through the firing line were destroyed by the horse-holders. It may fairly be argued that had the two squadrons met with shock tactics, no such crushing effect could possibly have been attained. It is interesting that in one morning two incidents should have occurred which bore so directly upon the perennial dispute between the partisans of the arme blanche and those of the rifle. On the 8th the orders were to advance towards Château-Thierry and to endeavour to reach the Marne. The Germans were retreating fast, but rather on account of their generally faulty strategical position than from tactical compulsion, and they covered themselves with continual rearguard actions, especially along the line of the Petit Morin. It is one of the noticeable results, however, of the use of aircraft that the bluff of a rearguard has disappeared and that it is no longer possible to make such a retreat as Masséna from Torres Vedras, where the pursuer never knew if he were striking at a substance or a shadow. Gough's Second Cavalry Division, which consisted of the Third and Fifth Brigades, swept along and the infantry followed hard at the heels of the horses, Doran's Eighth Brigade suffering the loss of about a hundred men when held up at the crossing of the Petit Morin River near Orly, which they traversed eventually under an effective covering fire from J Battery, R.H.A. The First Army Corps upon this day forced the Petit Morin at two places, both near La Trétoire, north of Rebaix. The First Division secured the passage at Sablonnières, where the Black Watch seized the heights, causing the German rearguard some losses and taking sixty prisoners. The Second Division met with considerable resistance, but the and Worcesters got over at Le Gravier and the 2nd Grenadier Guards at La Forge. The enemy was then driven from the river bank into the woods, where they were practically surrounded and had eventually to surrender. Eight machine-guns and three hundred and fifty prisoners, many of them from the Guards' Jaeger Battalion, were captured. Six of these machine-guns fell to the Irish Guards. The Second Army Corps passed the Petit Morin near St. Cyr and St. Ouen, the Thirteenth Brigade attacking the former and the Fourteenth the latter, both being villages on the farther side of the river. Such fighting as there was in this quarter came largely to the 1st Surrey and 2nd Cornwalls, of Rolt's Brigade, but the resistance was not great, and was broken by the artillery fire. To the soldiers engaged the whole action was more like a route march with occasional deployments than a battle. On the 9th the Army was up to the Marne and was faced with the problem of crossing it. The operations extending over many miles were unimportant in detail, though of some consequence in the mass. The real hard fighting was falling upon the Sixth French Army north of Ligny, which was still in desperate conflict with the German right; and upon Foch's army, which was fighting magnificently at Fère-Champenoise. The advance of the British, together with their own valour, caused the Germans to retire and cleared the passage over the Ourcq for our Allies. The chief losses during the day upon the British side fell upon the Guards' Brigade, the 1st Lincolns, and the 2nd Cornwalls, most of which were inflicted by invisible quick-firing , batteries shrouded by the woods which flank the river. 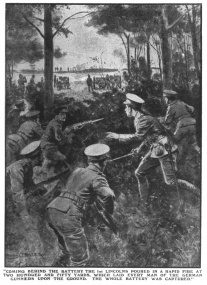 The latter regiment lost Colonel Turner, Major Cornish-Bowden, and a number of men in a brilliant piece of woodland fighting, where they drove in a strong German rearguard. The 1st Surrey, who were very forward in the movement, were also hard hit, having six officers' and about one hundred and twenty men out of action. The 1st Lincolns and the Guns. The British infantry was able on this day to show that woods may serve for other purposes besides hiding batteries. The 1st Lincolns, being held up by a rapid and accurate fire from invisible guns, dispatched two companies, C and D, to make in single file a détour under the shelter of the trees. Coming behind the battery, which appears to have had no immediate support, they poured in a rapid fire at two hundred and fifty yards, which laid every man of the German gunners upon the ground. The whole battery was captured. The casualties of the Lincolns in this dashing exploit, which included Captains Hoskyns and Ellison, with Lieutenant Thrust on, were unavoidably caused by British shrapnel, our gunners knowing nothing of the movement. On this date (September 9th) both the First and the Second Army Corps were across the Marne, and advanced some miles to the north of it, killing, wounding, or capturing many hundreds of the enemy. The Sixth French Army was, as stated, fighting hard upon the Ourcq, but the Fifth had won a brilliant success near Montmirail and driven the enemy completely over the river. Pulteney's Third Corps, still a division short, had been held up by the destruction of the bridges at La Ferté, but on September 10th they were across and the whole Army sweeping northwards. The cavalry over-rode all resistance and rounded up a number of prisoners, over two thousand in all. It was a strange reversal of fortune, for here within a fortnight were the same two armies playing the converse parts, the British eagerly pushing on with a flushed consciousness of victory, while the Germans, tired and dispirited, scattered in groups among the woods or were gathered up from the roadsides. It was a day of mist and rain, with muddy, sodden roads, but all weather is fine weather to the army that is gaining ground. An impression of complete German demoralization became more widespread as transport, shells, and even guns were found littering the high roads, and yet there was really even less cause for it than when the same delusion was held by the Germans. The enemy were actually making a hurried but orderly retreat, and these signs of disaster were only the evidence of a broken rear-guard resistance. German armies do not readily dissolve. There is no more cohesive force in the world. But they were undoubtedly hard pressed. Sixth Brigade's Action at Hautvesnes. About eight o'clock upon the morning of the 10th the Sixth Brigade (Davies') observed a column of the enemy's infantry on a parallel road near the village of Hautvesnes. Artillery fire was at once opened upon them, and a vigorous infantry attack, the 1st Rifles advancing direct with the 1st Berkshires on their right, while the 1st King's Liverpool worked round each flank in Boer fashion. The 2nd Staffords were in support. The Germans had taken refuge in a sunken road, but they were mercilessly lashed by shrapnel, and four hundred of them ran forward with their hands up. The sunken road was filled with their dead and wounded. Some hundreds streamed away across country, but these were mostly gathered up by the Third Division on the left. In this brisk little action the 50th R.F.A., and later the whole of the 34th Brigade R.F.A., put in some fine work, the shrapnel-fire being most deadly and accurate. The British had pushed their guns freely forward with their cavalry and did much execution with them, though they had the misfortune on this same date, the loth, to lose, by the answering shell-fire of the enemy, General Findlay, artillery commander of the First Division. In this second action, in which the German rearguard, infantry as well as artillery, was engaged, the 2nd Sussex Regiment, which was leading the First Division, sustained considerable losses near Courchamps or Priez, as did the 1st Northamptons and the 1st North Lancashires. Some three hundred of Bulfin's Second Brigade were hit altogether, among whom was Colonel Knight, of the North Lancashires. The enemy came under heavy fire, both from the infantry and from the guns, so that their losses were considerable, and several hundred of them were captured. The country was very hilly, and the roads so bad that in the exhausted state of men and horses the pursuit could not be sufficiently pressed. 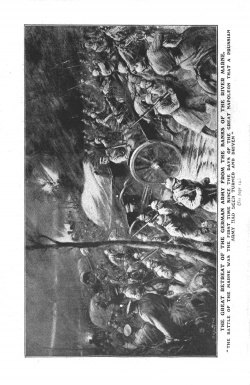 Ninth Brigade's Capture of Germans at Vinly. On this same date the Ninth Brigade captured six hundred German infantry, the survivors of a battalion, at the village of Vinly. This seems to have been an incident of the same character as the loss of the Cheshires or of the Munsters in the British retreat, where a body of troops fighting a covering action was left too long, or failed to receive the orders for its withdrawal. The defence was by no means a desperate one, and few of the attacking infantry were killed or wounded. On this date the Fifth and Sixth French Armies were hardly engaged at all, and the whole Allied Force, including General Foch's Seventh French Army on the right of the Fifth, were all sweeping along together in a single rolling steel-crested wave, composed of at least twelve army corps, whilst nine German corps (five of Von Kluck and four of Bülow) retired swiftly before them, hurrying towards the chance of reforming and refitting which the Aisne position would afford them. On September 11th the British were still advancing upon a somewhat narrowed front. There was no opposition, and again the day bore a considerable crop of prisoners and other trophies. The weather had become so foggy that the aircraft were useless, and it is only when these wonderful scouters are precluded from rising that a general realizes how indispensable they have become to him. As a wit expressed it, they have turned war from a game of cards into a game of chess. It was still very wet, and the Army was exposed to considerable privation, most of the officers and men having neither change of clothing, overcoats, nor waterproof sheets, while the blowing up of bridges on the lines of communication had made it impossible to supply the wants. The undefeatable commissariat, however, was still working well, which means that the Army was doing the same. Or the 12th the pursuit was continued as far as the River Aisne. Allenby's cavalry occupied Braine in the early morning, the Queen's Bays being particularly active, but there was so much resistance that the Third Division was needed to make the ground good. Gough's Cavalry Division also ran into the enemy near Chassemy, killing or capturing several hundred of the German infantry. In these operations Captain Stewart, whose experience as an alleged spy has been mentioned, met with a soldier's death. On this day the Sixth French Army was fighting a considerable action upon the British left in the vicinity of Soissons, the Germans making a stand in order to give time for their impedimenta to get over the river. In this they succeeded, so that when the Allied Forces reached the Aisne, which is an unfordable stream some sixty yards from bank to bank, the retiring army had got across it had destroyed most of the bridges, and showed every sign of being prepared to dispute the crossing. The Problem of the Aisne. Missy Bridge, facing the Fifth Division, appeared at first to be intact, but a daring reconnaissance by Lieutenant Pennecuick, of the Engineers, showed that it was really badly damaged. Condé Bridge was intact, but was so covered by a high horse-shoe formation of hills upon the farther side that it could not be used, and remained throughout under control of the enemy. Bourg Bridge, however, in front of the First Army Corps, had for some unexplained reason been left undamaged, and this was seized late in the evening — an evening of tempestuous rain and wind — by De Lisle's cavalry, followed rapidly by Bulfin's Second Brigade. It was on the face of it a somewhat desperate enterprise which lay immediately in front of the British general. If the enemy were still retreating he could not afford to slacken his pursuit, while, on the other hand, if the enemy were merely making a feint of resistance, then, at all hazards, the stream must be forced and the rearguard driven in. The German infantry could be seen streaming up the roads on the farther bank of the river, but there were no signs of what their next disposition might be. Air reconnaissance was still precluded, and it was impossible to say for certain which alternative might prove to be correct, but Sir John French's cavalry training must incline him always to the braver course. 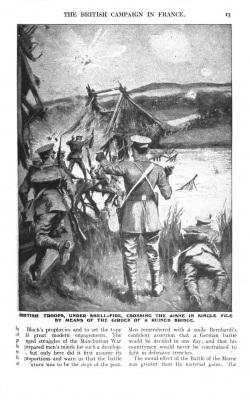 The officer who rode through the Boers to Kimberley and threw himself with his weary men across the path of the formidable Kronje was not likely to stand hesitating upon the banks of the Aisne. His personal opinion was that the enemy meant to stand and fight, but none the less the order was given to cross. September 13th was spent in arranging this dashing and dangerous movement. The British got across eventually in several places and by various devices. Bulfin's men, followed by the rest of the First Division of Haig's Army Corps, passed the canal bridge of Bourg with no loss or difficulty. The Eleventh Brigade of Pulteney's Third Corps got some men across by a ferry in the neighbourhood of Venizel. They were followed by the Twelfth Brigade, who established themselves near Bucy. The Thirteenth Brigade was held up at Missy, but the Fourteenth got across and lined up with the men of the Third Corps in the neighbourhood of Ste. Marguerite, meeting with a considerable resistance from the Germans. Later, Count Gleichen's Fifteenth Brigade also got across. On the right Hamilton got over with two brigades of the Third Division, the Third Brigade crossing on a single plank at Vailly and the Ninth using the railway bridge, while the whole of Haig's First Corps had before evening got a footing upon the farther bank. 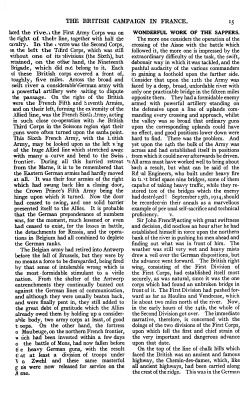 So eager was the advance and so inadequate the means that Haking's Fifth Brigade of Infantry, led by the Connaught Rangers, was obliged to get over the broad and dangerous river walking in single file along the sloping girder of a ruined bridge, under a heavy, though distant, shell-fire. 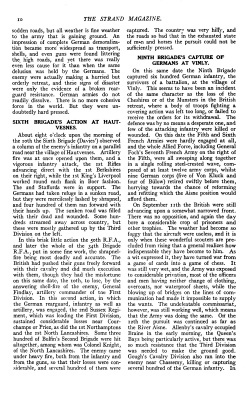 The night of September 13th saw the main body of the Army across the river, already conscious of a strong rearguard action, but not yet aware that the whole German army had halted and was turning at bay. On the right De Lisle's cavalrymen had pushed up the slope from Bourg Bridge and reached as far as Vendresse, where they were pulled up by the German lines. It has been mentioned above that the Eleventh and Twelfth Brigades of the Fourth Division had passed the river at Venizel. These troops were across in the early afternoon, and they at once advanced, and proved that in that portion of the field the enemy were undoubtedly standing fast. The Eleventh Brigade, which was more to the north, had only a constant shell-fall to endure, but the Twelfth, pushing forward through Bucy-le-long, found itself in front of a line of woods from which there swept a heavy machine-gun and rifle-fire. The advance was headed by the 2nd Lancashire Fusiliers supported by the 2nd Inniskilling Fusiliers. It was across open ground and under heavy fire, but it was admirably carried out. In places where the machine-guns had got the exact range the stricken Fusiliers lay dead or wounded with accurate intervals, like a firing-line on a field day. The losses were heavy, especially in the Lancashire Fusiliers. Colonel Griffin was wounded, and five of his officers with two hundred and fifty men were among the casualties. It should be recorded that fresh supplies of ammunition were brought up at personal risk by Colonel Seely, late Minister of War, in his motor-car. The contest continued until dusk, when the troops waited for the battle of next day under such cover as they could find. fu.. Bloch's prophecies and to set the type of ..ill great modern engagements. The p..nged struggles of the Manchurian War .... prepared men's minds for such a development, but only here did it first assume its fu.. proportions and warn us that the battle of ... future was to be the siege of the past. Men remembered with a smile Bernhardi's confident assertion that a German battle would be decided in one day, and that his countrymen would never be constrained to fight in defensive trenches. 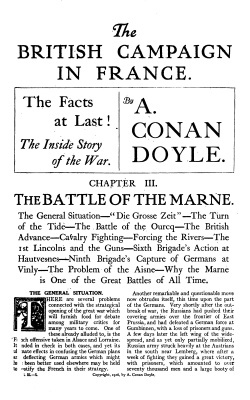 The moral effect of the Battle of the Marne was greater than its material gains. The latter, so far as the British were concerned, did not exceed five thousand prisoners, twenty guns, and a quantity of transport. The total losses, however, were very heavy. The Germans had perfected a method of burning their dead with the aid of petrol. These numerous holocausts over the countryside were found afterwards by the peasants to have left mounds of charred animal matter which were scattered by their industrious hands on the fields which they might help to fertilize. The heat of cremation had dissolved the bones, but the teeth in most cases remained intact, so that over an area of France it was no uncommon thing to see them gleaming in the clods on either side of the new-cut furrow. Had the ring of high-born German criminals who planned the war seen in some apocalyptic vision the detailed results of their own villainy, it is hard to doubt that even their hearts and consciences would have shrunk from the deed. Apart from the losses the mere fact that a great German army had been hustled across thirty miles of country, had been driven from river to river, and had finally to take refuge in trenches in order to hold their ground, was a great encouragement to the Allies. From that time they felt assured that with anything like equal numbers they had an ascendancy over their opponents. Save in the matter of heavy guns and machine-guns, there was not a single arm in which they did not feel that they were the equals or the superiors. Nor could they forget that this foe, whom they were driving in the open and holding in the trenches, was one who had rushed into the war with men and material all carefully prepared for this day of battle, while their own strength lay in the future. If the present was bright, it would surely be incomparably brighter when the reserves of France and the vast resources of the British Empire were finally brought into line. There had never from the beginning been a doubt of final victory, but from this time on it became less an opinion and more a demonstrable and mathematical certainty. Why the Marne is one off the Great Battles of All Time. The battle must also be regarded as a fixed point in military history, since it was the first time since the days of the great Napoleon that a Prussian army had been turned and driven. In three successive wars — against the Danes, the Austrians, and the French — they had lived always in the warm sunshine of success. Now, at last, came the first chill of disaster. Partly from their excellent military qualities, but even more on account of their elaborate and methodical preparations, joined with a want of scruple which allowed them to force a war at the moment when they could take their adversary at a disadvantage, they had established a legend of invincibility. This they left behind them with their cannon and their prisoners between the Marne and the Aisne. It had been feared that free men, trained in liberal and humane methods, could never equal in military efficiency those who had passed through the savage discipline which is the heritage of the methods that first made Prussia great at the expense of her neighbours. This shadow was henceforth for ever lifted from men's minds, and it was shown that the kindly comradeship which exists in the Western armies between officers and men was not incompatible with the finest fighting qualities of which any soldiers are capable. Chapter IV. The Battle of the Aisne. 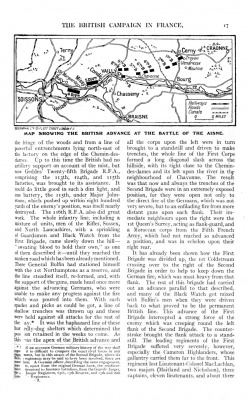 The Hazardous Crossing of the Aisne — Wonderful Work of the Sappers — The Fight for the Sugar Factory — General Advance of the Army — The Fourth (Guards) Brigade's Difficult Task — Cavalry as a Mobile Reserve. 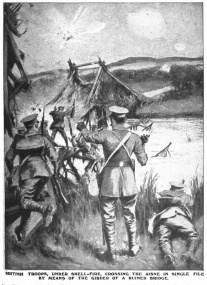 The Hazardous Crossing of the Aisne. The stretch of river which confronted the British Army when they set about the hazardous crossing of the Aisne was about fifteen miles in length. It lay as nearly as possible east and west, so that the advance was from south to north. As the British faced the river the First Army Corps was on the right of their line, together with half the cavalry. In the centre was the Second Corps, on the left the Third Corps, which was still without one of its divisions (the Sixth), but retained, on the other hand, the Nineteenth Brigade, which did not belong to it. Each of these British corps covered a front of, roughly, five miles. Across the broad and swift river a considerable German army with a powerful artillery were waiting to dispute the passage. On the right of the British were the French Fifth and Seventh Armies, and on their left, forming the extremity of the Allied line, was the French Sixth Army, acting in such close co-operation with the British Third Corps in the Soissons region that their guns were often turned upon the same point. This Sixth French Army, with the British Army, may be looked upon as the left wing of the huge Allied line which stretched away with many a, curve and bend to the Swiss frontier. During all this hurried retreat from the Marne, it is to be remembered that the Eastern German armies had hardly moved at all. It was their four armies of the right which had swung back like a closing door, the Crown Prince's Fifth Army being the hinge upon which it turned. Now the door bad ceased to swing, and one solid barrier presented itself to the Allies. It is probable that the German preponderance of numbers was, for the moment, much lessened or even had ceased to exist, for the losses in battle, the detachments for Russia, and the operations in Belgium had all combined to deplete the German ranks. The Belgian army had retired into Antwerp before the fall of Brussels, but they were by no means a force to be disregarded, being fired by that sense of intolerable wrong which is the most formidable stimulant to a virile nation. Froth the shelter of the Antwerp entrenchments they continually buzzed out against the German lines of communication, and although they were usually beaten back, and were finally pent in, they still added to the great debt of gratitude which the Allies already owed them by holding up a considerable body, two army corps at least, of good troops. 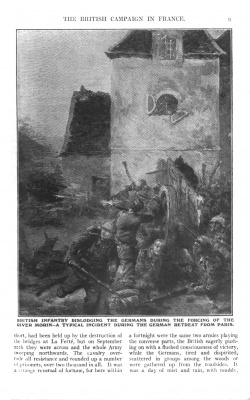 On the other hand, the fortress of Maubeuge, on the northern French frontier, which had been invested within a few days of the battle of Mons, had now fallen before the heavy German guns, with the result that at least a division of troops under Von Zwehl and these same masterful guns were now released for service on the Aisne. Wonderful Work of the Sappers. The more one considers the operation of the crossing of the Aisne with the battle which followed it, the more one is impressed by the extraordinary difficulty of the task, the swift, debonair way in which it was tackled, and the pushful audacity of the various commanders in gaining a foothold upon the farther side. Consider that upon the 12th the Army was faced by a deep, broad, unfordable river with only one practicable bridge in the fifteen miles opposite them. They had a formidable enemy armed with powerful artillery standing on the defensive upon a line of uplands commanding every crossing and approach, whilst the valley was so broad that ordinary guns upon the corresponding uplands could have no effect, and good positions lower down were hard to find. There was the problem. And yet upon the 14th the bulk of the Army was across and had established itself in positions from which it could never afterwards be driven. All arms must have worked well to bring about such a result, but what can be said of the Royal Engineers, who built under heavy fire in that brief space nine bridges, some of them capable of taking heavy traffic, while they restored five of the bridges which the enemy had destroyed! September 13th, 1914, should be recorded in their annals as a marvellous example of personal self-sacrifice and technical proficiency. Sir John French, acting with great swiftness and decision, did not lose an hour after he had established himself in force upon the northern bank of the river in pushing his men ahead and finding out what was in front of him. The weather was still very. wet and heavy mists drew a veil over the German dispositions, but the advance went forward. The British right wing, consisting of the First Division of the First Corps, had established itself most securely, as was natural, since it was the one corps which had found an unbroken bridge in front of it. The First Division had pushed for-ward as far as Moulins and Vendresse, which lie about two miles north of the river. Now, in the early hours of the 14th, the whole of the Second Division got over. The immediate narrative, therefore, is concerned with the doings of the two divisions of the First Corps, upon which fell the first and chief strain of the very important and dangerous advance upon that date. On the top of the line of chalk hills which faced the British was an ancient and famous highway, the Chemin-des-dames, which, like all ancient highways, had been carried along the crest of the ridge. This was in the German possession, and it became the objective of the British attack. The Second Infantry Brigade (Bulfin's) led the way, working upwards in the early morning from Vendresse through the hamlet of Troyon towards the great road. This brigade, consisting of the 2nd Sussex, 1st Northamptons, 1st North Lancashire, and 2nd Rifles, drawn mostly from solid shire regiments, was second to none in the Army. Just north of Troyon was a considerable deserted sugar factory, which formed a feature in the landscape. It lay within a few hundred yards of the Chemin-des-dames, while another winding road, cut in the side of the hill, lay an equal distance to the south of it, and was crossed by the British in their advance. This road, which was somewhat sunken in the chalk, and thus offered some cover to a crouching man, played an important part in the operations. The Fight for the Sugar Factory. Lieutenant Balfour and a picket of the 2nd Rifles, having crept up and reconnoitred the factory, returned with the information that it was held by the Germans and that twelve guns were in position three hundred yards to the east of it. General Bulfin then — it was about three-thirty in the morning — sent the 2nd Rifles and the 2nd Sussex Regiment forward, with the factory and an adjoining whitewashed farmhouse as their objective. The 1st North Lancashires followed in immediate support, while the 1st Northamptons remained in reserve. The attacking force was under the immediate command of Colonel Serocold, of the Rifles. The three advanced regiments drove in the pickets of the Germans and after a severe fight turned the enemy out of his front trench, A company of the Sussex capturing several hundred prisoners. A number of men, however, including Colonel Montresor, were shot while rounding up these Germans and sending them to the rear. 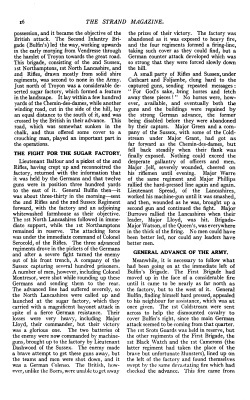 The advanced line had suffered severely, so the North Lancashires were called up and launched at the sugar factory, which they carried with a magnificent bayonet attack in spite of a fierce German resistance. Their losses were very heavy, including Major Lloyd, their commander, but their victory was a glorious one. The two batteries of the enemy were now commanded by machine-guns, brought up to the factory by Lieutenant Dashwood of the Sussex. The enemy made a brave attempt to get these guns away, but the teams and men were shot down, and it was a German Colense. The British, how¬ever, unlike the Boers, were unable to get away the prizes of their victory. The factory was abandoned as it was exposed to heavy fire, and the four regiments formed a firing-line, taking such cover as they could find, but a German counter attack developed which was so strong that they were forced slowly down the hill. A small party of Rifles and Sussex, under Cathcart and Foljambe, clung hard to the captured guns, sending repeated messages : "For God's sake, bring horses and fetch away these pieces!" No horses were, however, available, and eventually both the guns and the buildings were regained by the strong German advance, the former being disabled before they were abandoned by their captors. Major Green and a company of the Sussex, with some of the Cold¬stream under Major Grant, had got as far forward as the Chemin-des-dames, but fell back steadily when their flank was finally exposed. Nothing could exceed the desperate gallantry of officers and men. Major Jelf, severely wounded, cheered on his riflemen until evening. Major Warre of the same regiment and Major Phillips rallied the hard-pressed line again and again. 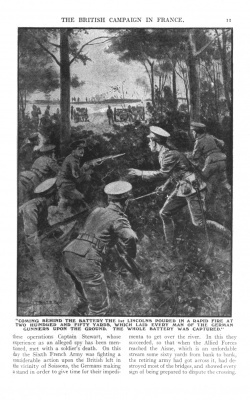 Lieutenant Spread, of the Lancashires, worked his machine-gun until it was smashed, and then, wounded as he was, brought up a second gun and continued the fight. Major Burrows rallied the Lancashires when their leader, Major Lloyd, was hit. Brigade-Major Watson, of the Queen's, was everywhere in the thick of the firing. No men could have been better led, nor could any leaders have better men. General Advance of the Army. Meanwhile, it is necessary to follow what had been going on at the immediate left of Bulfin's Brigade. The First Brigade had moved up in the face of a considerable fire until it came to be nearly as far north as the factory, but to the west of it. General Bulfin, finding himself hard pressed, appealed to his neighbour for assistance, which was at once given. The 1st Coldstream were sent across to help the dismounted cavalry to cover Bulfin's right, since the main German attack seemed to be coming from that quarter. 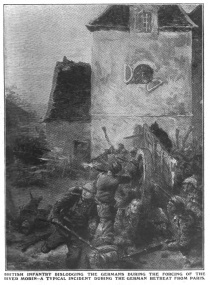 The 1st Scots Guards was held in reserve, but the other regiments of the First Brigade, the 1st Black Watch and the 1st Cameron (the latter regiment had taken the place of the brave but unfortunate Munsters), lined up on the left of the factory and found themselves swept by the same devastating fire which had checked the advance. This fire came from the fringe of the woods and from a line of powerful entrenchments lying north-east of the factory on the edge of the Chemin-des-dames. Up to this time the British had no artillery, support on account of the mist, but now Geddes' Twenty-fifth Brigade R.F.A., comprising the 113th, 114th, and 115th Batteries, was brought to its assistance. It could do little good in such a dim light, and one battery, the 115th, under Major Johnstone, which pushed up within eight hundred yards of the enemy's position, was itself nearly destroyed. The 116th R.F.A. also did great work. The whole infantry line, including a mixture of units, men of the Rifles, Sussex, and North Lancashires, with a sprinkling of Guardsmen and Black Watch from the first Brigade, came slowly down the hill — "sweating blood to hold their own," as one of them described it — until they reached the sunken road which has been already mentioned. There General Bulfin had stationed himself with the 1st Northamptons as a reserve, and the line steadied itself, reformed, and, with the support of the guns, made head once more against the advancing Germans, who were unable to make any progress against the fire which was poured into them. With such spades and picks as could be got, a line of shallow trenches was thrown up and these were held against all attacks for the rest of the day. It was the haphazard line of these hurriedly-dug shelters which determined the position retained in the weeks to come. As this was the apex of the British advance and all the corps upon the left were in turn brought to a standstill and driven to make trenches, the whole line of the First Corps formed a long diagonal slash across the hillside, with its right close to the Chemin-des-dames and its left upon the river in the neighbourhood of Chavonne. The result was that now and always the trenches of the Second Brigade were in an extremely exposed position, for they were open not only to the direct fire of the Germans, which was not very severe, but to an enfilading fire from more distant guns upon each flank. Their immediate neighbours upon the right were the 1st Queen's Surrey, acting as flank-guard, and a Moroccan corps from the Fifth French Army, which had not reached so advanced a position, and was in echelon upon their right rear. It has already been shown how the First Brigade was divided up, the 1st Coldstream crossing over to the right of the Second Brigade in order to help to keep down the German fire, which was most heavy from that flank. The rest of this brigade had carried out an advance parallel to that described, and many of the Back Watch got mixed with Bulfin's men when they were driven back to what proved to be the permanent British line. This advance of the First Brigade intercepted a strong force of the enemy which was creeping round the left clank of the Second Brigade. The counter-stroke brought the flank attack to a stand-still. The leading regiments of the First Brigade suffered very severely, however, especially the Cameron Highlanders, whose gallantry carried them far to the front. This regiment lost Lieutenant-Colonel MacLachlan, two majors (Maitland and Nicholson), three captains, eleven lieutenants, and about three hundred rank and file in the action. Some of these fell into the hands of the enemy, but the great majority were killed or wounded. When the line on their right fell back, they conformed to the movement until they received support from two companies of the 1st Gloucesters from the Third Brigade upon their left rear. 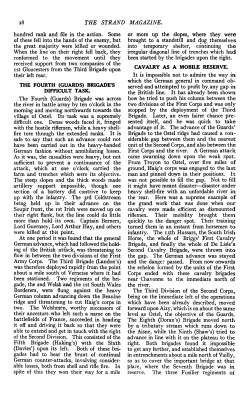 The Fourth (Guards) Brigade's Difficult Task. The Fourth (Guards) Brigade was across the river in battle array by ten o'clock in the morning and moving northwards towards the village of Ostel. Its task was a supremely difficult one. Dense woods faced it, fringed with the hostile riflemen, while a heavy shellfire tore through the extended ranks. It is safe to say that such an advance could not have been carried out in the heavy-handed German fashion without annihilating losses. As it was, the casualties were heavy, but not sufficient to prevent a continuance of the attack, which at one o'clock carried the farm and trenches which were its objective. The steep slopes and the thick woods made artillery support impossible, though one section of a battery did contrive to keep up with the infantry. The 3rd Coldstream being held up in their advance on the Soupir front, the 1st Irish were moved up on their right flank, but the line could do little more than hold its own. Captain Berners, Lord Guernsey, Lord Arthur Hay, and others were killed at this point. At one period it was found that the general German advance, which had followed the holding of the British attack, was threatening to flow in between the two divisions of the First Army Corps. The Third Brigade (Landon's) was therefore deployed rapidly from the point about a mile south of Vernesse where it had been stationed. Two regiments of the brigade, the 2nd Welsh and the 1st South Wales Borderers, were flung against the heavy German column advancing down the Beaulne ridge and threatening to cut Haig's corps in two. The Welshmen, worthy successors of their ancestors who left such a name on the battlefields of France, succeeded in heading it off and driving it back so that they were able to extend and get in touch with the right of the Second Di vision. This consisted of the Fifth Brigade (Haking's) with the Sixth (Davies') upon its left. Both of these brigades had to bear the brunt of continual German counter-attacks, involving considerable losses, both from shell and rifle fire. In spite of this they won their way for a mile or more up the slopes, where they were brought to a standstill and dug themselves into temporary shelter, continuing the irregular diagonal line of trenches which had been started by the brigades upon the right. Cavalry as a Mobile Reserve. It is impossible not to admire the way in which the German general in command observed and attempted to profit by any gap in the British line. It has already been shown how he tried to push his column between the two divisions of the First Corps and was only stopped by the deployment of the Third Brigade. Later, an even fairer chance presented itself, and he was quick to take advantage of it. The advance of the Guards' Brigade to the Ostel ridge had caused a considerable gap between them and the nearest unit of the Second Corps, and also between the First Corps and the river. A German attack came swarming down upon the weak spot. From Troyon to Ostel, over five· miles of ground, Haig's corps was engaged to the last man and pinned down in their positions. It was not possible t o fill the gap. Not to fill it might have meant disaster-disaster under heavy shell-fire with an unfordable river in the rear. Here was a supreme example of the grand work that was done when our cavalry were made efficient as dismounted riflemen. Their mobility brought them quickly to the danger spot. Their training turned them in an instant from horsemen to infantry. The 15th Hussars, the South Irish Horse, the whole of Briggs' First Cavalry Brigade, and finally the whole of De Lisle's Second Cavalry Brigade, were thrown into the gap. The German advance was stayed and the danger passed. From now onwards the echelon formed by the units of the First Corps ended with these cavalry brigades near Chavonne to the immediate north of the river. The Third Division of the Second Corps, being on the immediate left of the operations which have been already described, moved forward upon Aizy, which is on about the same level as Ostel, the objective of the Guards. The Eighth (Doran's) Brigade moved north by a tributary stream which runs down to the Aisne, while the Ninth (Shaw's) tried to advance in line with it on the plateau to the right. Both brigades found it impossible to get any farther, and established themselves in entrenchments about a mile north of Vailly, so as to cover the important bridge at that place, where the Seventh Brigade was in reserve. The three Fusilier regiments of the Ninth Brigade all lost heavily and the Lincoln had at one time to recross the river, but bravely recovered their position. The attack made by the Fifth Division near Missy was held up by a very strong German position among the woods which was fronted by wire entanglements. The regiments chiefly engaged were the Norfolks and Bedfords of the Fifteenth Brigade, with the Cornwalls and East Surreys of the Fourteenth Brigade, the remains of the Cheshires being in close support. They crossed the wire and made good progress at first, but were eventually brought to a stand by a heavy fire at close range from a trench upon their right front. It was already dusk, so the troops ended by maintaining the position at Missy and Ste. Marguerite, where there were bridges to be guarded. 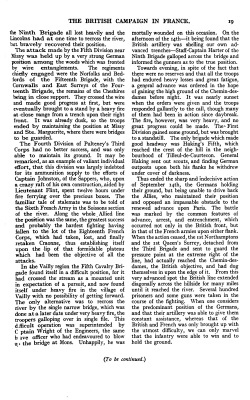 The Fourth Division of Pulteney's Third Corps had no better success, and was only able to maintain its ground. It may be remarked, as an example of valiant individual effort, that this division was largely indebted for its ammunition supply to the efforts of Captain Johnston, of the Sappers, who, upon a crazy raft of his own construction, aided by Lieutenant Flint, spent twelve hours under fire ferrying over the precious boxes. The familiar tale of stalemate was to be told of the Sixth French Army in the Soissons section of the river. Along the whole Allied line the position was the same, the greatest success and probably the hardest fighting having fallen to the lot of the Eighteenth French Corps, which had taken, lost, and finally retaken Craonne, thus establishing itself upon the lip of that formidable plateau which had been the objective of all the attacks. In the Vailly region the Fifth Cavalry Brigade found itself in a difficult position, for it bad crossed the stream as a mounted unit in expectation of a pursuit, and now found itself under heavy fire in the village of Vailly with no possibility of getting forward. The only alternative was to recross the river by the single narrow bridge, which was done at a later date under very heavy fire, the troopers galloping over in single file. This difficult operation was superintended by Captain Wright of the Engineers, the same ave officer who had endeavoured to blow up the bridge at Mons. Unhappily, he was mortally wounded on this occasion. On the afternoon of the 14th — it being found that the British artillery was shelling our own advanced trenches — Staff-Captain Harter of the Ninth Brigade galloped across the bridge and informed the gunners as to the true position. Towards evening, in spite of the fact that there were no reserves and that all the troops had endured heavy losses and great fatigue, a general advance was ordered in the hope of gaining the high ground of the Chemin-des¬dames before night. It was nearly sunset when the orders were given and the troops responded gallantly to the call, though many of them had been in action since daybreak. The fire, however, was very heavy, and no great progress could be made. The First Division gained some ground, but was brought to a standstill. The only brigade which made good headway was Haking's Fifth, which reached the crest of the hill in the neighbourhood of Tilleul-de-Courtecon. General Haking sent out scouts, and finding German outposts upon both his flanks he withdrew under cover of darkness. Thus ended the sharp and indecisive action of September 14th, the Germans holding their ground, but being unable to drive back the Allies, who maintained their position and opposed an impassable obstacle to the renewed advance upon Paris. The battle was marked by the common features of advance, arrest, and entrenchment, which occurred not only in the British front, but in that of the French armies upon either flank. When the action ceased, the 1st Northampton and the 1st Queen's Surrey, detached from the Third Brigade and sent to guard the pressure point at the extreme right of the line, had actually reached the Chemin-des-dames, the British objective, and had dug themselves in upon the edge of it. From this very advanced spot the British line extended diagonally across the hillside for many miles until it reached the river. Several hundred prisoners and some guns were taken in the course of the fighting. When one considers the predominant position of the Germans, and that their artillery was able to give them constant assistance, whereas that of the British and French was only brought up with the utmost difficulty, we can only marvel that the infantry were able to win and to hold the ground. ↑ Until an accurate German military history of the war whall appear, it is difficult to compute the exact rival forces in any engagement, but in this attack of the Second Brigade, where six British regiments may be said to have been involved, there are some data. A German officer, describing the same engagement, says .. but, apart from the original German force, the reinforcement mounted to fourteen battalions, from the Guards' Jaeger, the 4..th Jaeger Regiment, 65th, 13th Reserve, and 13th an 16th Lan... Regiments. This page was last edited on 10 March 2018, at 16:19.